After more than 15 years as a cook in several Miami Beach restaurants, Carlos Perez joined the Eagle Rock School family last fall, working in our kitchen as a chef instructor. While professionally trained to prepare gourmet meals in a number of styles — including Latin, Italian and American — Carlos admits his favorite task at Eagle Rock is coming out from behind the stoves and ovens and supervising student kitchen patrol teams in meal preparation and cleanup, as well as instructing students in food preparation technique for a few hours each week. 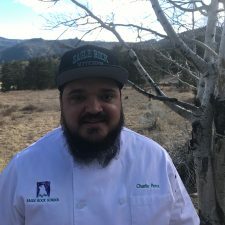 Carlos Perez: As a cook instructor, I get to spend time each Wednesday and Saturday instructing Eagle Rock School students in a variety of cooking functions and techniques. And while I love to cook, what I really look forward to the most is instructing the students and being a part of their development. Eagle Rock: What did you do for work before arriving at Eagle Rock? Carlos: I was a cook in Miami at several restaurants, including a steakhouse, and restaurants serving Italian, Latin American and fusion cuisines. My favorite type of food to cook is Italian and that is where the majority of my skills can be found. My favorite Italian dish to make is just about anything that includes pasta. Carlos: I haven’t been at Eagle Rock long enough to have a favorite story, but when I was the age of the students here, I was a lot like many of them. I just wasn’t into traditional education. Instead, I quit school and became a father at 17. Because I had to work to support my newborn son, school wasn’t a part of my life any more. Now I’m 41 years old and, in addition to my 24-year-old son who lives in Miami, I have a seven-year-old boy. Because of the amount of work I had to do, my mother helped raise my first son. Now, I’m raising my other son alongside my wife. So it’s like I’m getting to be a real father for the first time. Eagle Rock: Tell us about your hobbies or interests outside of work? Carlos: My wife is Elizabeth Rivera, who also works at Eagle Rock, and together we enjoy outdoor activities such as biking and hiking. Carlos: I went to the Miami Dade College where I studied English and culinary arts. In fact, that’s where I met Elizabeth. Carlos: I met (celebrity chef) Bobby Flay once in Miami and I’d like to be on his “Beat Bobby Flay” show. I’m sure I’d win with my signature dish of Peruvian ceviche. But my favorite show is “Top Chef” because I get ideas from the show on what to make and how to make it. In fact, I learned how to make Peruvian ceviche from that show. What’s something most people would be surprised to know about you? Carlos: That I have a 24-year-old son. His name is Eduardo and he lives in Miami. Everyone at Eagle Rock knows about my younger son, so now they know about Eduardo too. This entry was posted in Meet The Team and tagged Carlos Perez, Cooking.